Although I am sure someone is preparing for an exam this very minute, July/August are the traditional months to take a holiday and get some well earned rest. A holiday can be exactly what you need especially if you have just come to the end of a long period of study followed by in some instances, weeks of exams. I have to express a personal bias in so much that I believe holidays are essential if you are to be at your best. For me this years holiday has to provide some degree of relaxation after what has been a particularly busy 6 months. I am looking forward to a change of scene, meeting different people and the freedom to wake naturally, feeling rested after a good nights sleep. Holidays are of course very personal and for some an adventure holiday, travelling to new places every day, might be far more desirable. But one thing that all holidays should provide is the ability to relax and catch up on sleep, even if that means you climb two mountains, swim for three hours before crashing out in a state of satisfied exhaustion on the evening. Of course sleep is something you should do “properly” every day, it’s just that we don’t. 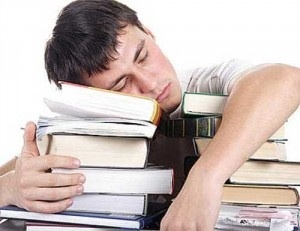 Modern life steals that vital rest time, this is acutely the case when trying to balance both work and study. Studying is often undertaken on an evening and sometimes late into the night as you effectively try to do, too much in too little time. We now sleep less than we did 50 years ago, it used to be around 8.5 hours, it’s now only 6.5. The sleep should also be of high quality, yet our sleep is interrupted by the lights of mobile phones, and sounds made when texts arrive late into the night. In order to sleep better it is a good idea to avoid light approximately 30 minutes before going to sleep, yet how many read in bed from iPads or equivalent with the bright light emitted from the screen telling your brain to stay awake. One restoration – some of our genes only turn on when we sleep, their role being to make essential repairs. Three consolidation – our brain revisit events and experiences, and begins to make sense of them, moving data into long term memory and solving complex problems. Susanne Diekelmann at the University of Tubingen in Germany says “sleep helps stabilise the memories and integrate them into a network of long-term memory, it also helps us to generalise what we’ve learnt, giving us the flexibility to apply the skills to new situations. So although you can’t soak up new material, you might instead be able to cement the facts or skills learned throughout the day.” Bodies need rest – the brain needs sleep Sometimes you may find yourself having to push sleep to one side and in specific situations thats fine. It’s when lack of sleep becomes the norm that problems arise, the result is greater stress, poor judgement and ineffective learning. So now the exams are over, take a break, get some quality sleep and try and make a few simple adjustments in you life so that sleep takes more of a priority. This entry was posted in Exam techniques, Exam tips, How to pass exams - tips, learning, sleep, Stress, Uncategorized and tagged Learning Theories, sleep, Stress. Bookmark the permalink.